Our close proximity to the new airport makes us a convenient location for your next beach getaway. The luxurious amenities available only at the new Palmetto Inn and Suites will make your visit truly spectacular. Whether Beachside or Northside, you are in for a treat! Welcome to the Palmetto Inn and Suites, your family-friendly vacation place. Our impressive number of repeat guests rate us #1 in amenities, hospitality, and especially in finding accommodations to suit their budgets. Come and stay with us to see for yourself the wide selection of rooms and the special extras we offer to make your stay unforgettable. A free airport shuttle can deliver you straight to our location on “The World’s Most Beautiful Beach,” and that’s when the vacation of your life will begin. Spend your first day taking full advantage of all that our vacation paradise has to offer, ranging from beach games, indoor and outdoor pools and a beachside playground to waverunner and parasail activities available on the Gulf. 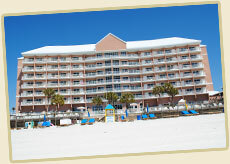 Try out the sundeck, collect shells on the shore, or relax in your spacious suite with cable TV and HBO. End the day watching a breathtaking sunset from your private gulf–front balcony.